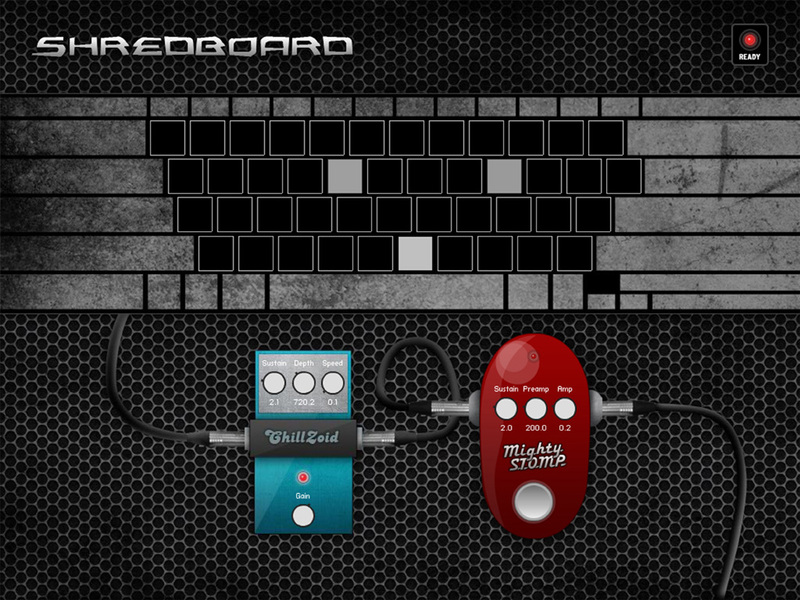 ShredBoard is an instrument that uses the conventional keyboard and mouse as input. The keys z-/, a-’, q-] and 1-= are mapped to the notes of four guitar strings starting at E, A, D, G for each row of keys. The mouse is mapped for use as an effects pedal. There are 2 effects – ChillZoid – a clean, ambient effect and MightySTOMP – a distorted synth effect. Parameters for each effect can be adjusted with 3 knobs to produce a variety of tones. The software is an AIR application written in ActionScript 3. The sounds are produced in SuperCollider by sending OSC messages via flosc. The flosc AS3 classes were modified for certain OSC messages to work correctly with SuperCollider.